Star-of-the-season Janis Auzins insists Peterborough Phantoms fans still haven’t seen the best of him. The Latvian netminder has enjoyed an excellent introduction into English Premier League hockey by back-stopping the city side’s rise to second place in the standings. Auzins was a magnificent match-winner last Saturday night by saving all three Manchester penalties as the reigning champions were seen off 2-1 following a shoot-out in a Planet Ice clash that went down to the wire. And the 23 year-old will be bidding to ensure 2014 ends on a high with victory at IceSheffield when they face Sheffield Steeldogs in their final league outing of the year on Saturday (7.30pm). Auzins said: “It is always nice for a goalie to save penalties like that and help the team to win. “It was one of my best nights so far for the club, but I know that I can still do much better. “I’m not that happy with my game at the moment because I don’t like to concede as many goals as I have done. “I sit at home and stay awake thinking about them and I want to put it right. Phantoms snapped up Auzins after a recommendation from another of their summer signings – forward Edgars Bebris. And boss Slava Koulikov is delighted with the way his last line of defence has settled into the British game. Koulikov said: “Edgars told me about Janis and we then did our homework on him. We felt he would be suited to play in this league and that has proved to be the case. Koulikov will put his players through their paces on Boxing Day ahead of the trip to Sheffield the following night. Their final fixture of 2014 comes on Sunday night at Planet Ice when they entertain lower-level Billingham in their latest English Challenge Cup clash (5.30pm). Koulikov hopes ill defencemen James Hutchinson and Cam McGiffin can return this weekend. Forward Marc Levers sustained the deep cut to his head after hitting the ice and being knocked unconscious following a collision with another player during their English Challenge Cup clash at Billingham. Levers received treatment at hospital in the North-East before being released later that night and he is targeting a rapid return to action when Phantoms travel to Sheffield in the English Premier League on Saturday. Phantoms came from behind to lead Billingham 2-1 at the time of the abandonment (which came 1:51 into the third period) thanks to a first senior goal from teenage talent Martins Susters and an Alan Lack strike. 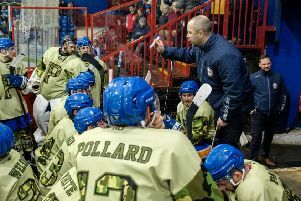 Phantoms used an all-British roster for the game as coach Slava Koulikov cast an eye over several promising youngsters. Islanders defenceman Callum Worthington-Evans was involved in a Phantoms game for the first time. It remains unclear whether or not the North Group clash, meaningless due to neither team being able to qualify for the latter stages of the competition, will be re-staged.